The RAN possessed 6 Ton Class Minesweepers of which HMAS HAWK was one. These vessels saw Active Service during the Indonesian Confrontation in the 1960's. 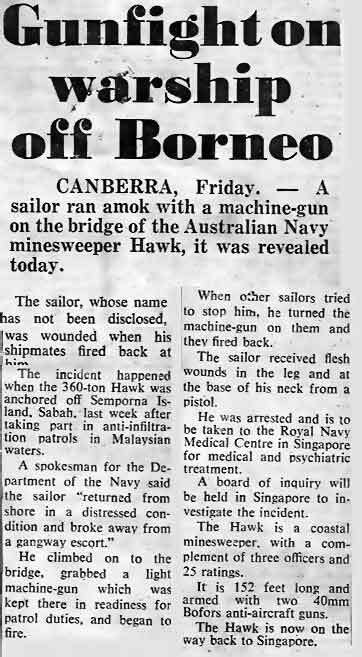 The incident detailed below became part of pussers folklore and has been retold many times over the past thirty years - here is the real version as told by Les Figg who was serving in HMAS HAWK at the time. - The Webmaster, Gun Plot. "I was serving in HMAS Hawk during the incident in March 1966, and recall it this way. AB 'Bungy' Williams had been confined to the ship for quite sometime - I cannot recall the trouble he was in. It may have been for telling the Malaysian/Indonesian interpreter to 'clean' a .303 rifle by firing a round while we were at anchor amongst the oil storage tanks off Singapore. Anyway, whilst berthed alongside in Semporna during a 6 week patrol, Bungy went ashore whilst still restricted to the ship (Soppage Of Leave) and had a few (too many) drinks. As part if his normal duties aboard at this time, Bungy, was in charge of all small arms. Upon returning to the ship in a state of severe inebriation he took up an Owen 9mm sub machine gun and many magazines of ammunition and began shooting. He made statements over the ship's intercom to the effect that he, "Didn't want to harm anyone, except for the officers!". In any case, he fired many rounds into the ships structure, and in fact, shot himself in the foot in the process. 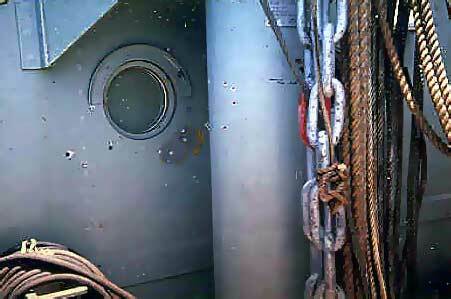 the time and lodged in the forward bulkhead. HMAS HAWK and all the other 'Ton Class' Minesweeepers of the RAN were only made of wood and aluminium and was no match for 9mm bullets fired at close range. He was finally subdued by another crewman who returned from ashore and obtained a .38 revolver from the engine room, he stalked Bungy and shot him with a glancing blow to the neck. He stated later that he did in fact aim for Bungy's body. A 'Tiffy' from Derwent inspecting/repairing damage to the bridge structure. 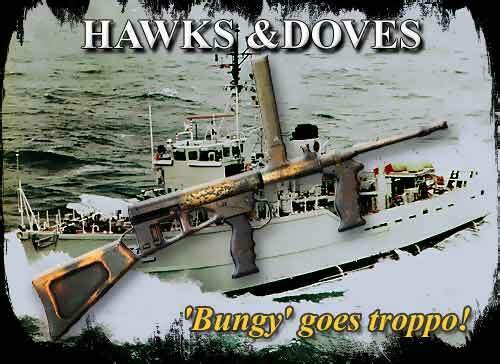 It is believed that AB Bungy Williams fired some 300 9mm rounds into the ship. Significant damage was done to the bridge/superstructure. The navigation radar was destroyed. Comm. 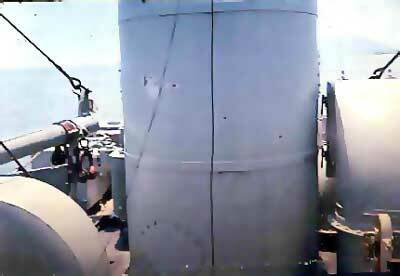 's equipment in the radio room was also damaged when he fired into the deck of the bridge and through into the radio room. Later crew from HMAS Derwent, which must have been patrolling nearby sent some of their sailors aboard to assess damage and assist in repairs. Some of the 9mm holes in the stack. 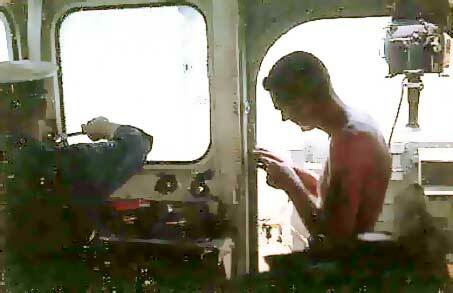 Bungy was transported to HMAS Derwent, and I never heard of him or saw him again. Although recently, I received information that he is living somewhere in Queensland."